The World of LordCraft is Coming! Imitation may be the sincerest form of flattery but it can also be a great way to get yourself sued or at least yelled at by hordes of angry gamers, as the people behind the new browser-based online game World of LordCraft will probably soon find out. Yes, that's right, World of LordCraft. Sound familiar? To their credit, the people behind the game don't feign ignorance about the world's most famous MMOG; in fact, a news post on the site's main page makes a point of acknowledging it. "World of warcraft is a classical game,we all love it . It gives us too much memory about azeroth. But most of peopleÂ can`t spent much time in WOW,job and life things allways take too much time.SO,world of loardcraft is coming now," the site says in glorious Engrish. "World of loardcraft isn`t a copy of wow,It`s a extension and you're gonna love it! World of loardcraft developed by a band of WOW big fans.So we know much more about WOW," it continues. 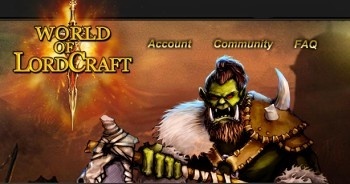 "World of loardcraft is a web game for the people who wanna play WOW but not have enough time. world of lordcraft`s player controls have been far superior to world of warcraft or anyother game.As a web game,world of lordcraft mainly player with mouse,you can spent just a few minutes to play world of lordcraft everyday.One more important change is that world of lordcraft offered two different fight models for player to choose : auto fight model and instantaneous fight model. That`s a new level which world of warcraft and other games far from it." There's more, but you get the idea. Despite playing up the connection to WoW, the game's creators also take pains to insist that it is actually completely different. World of LordCraft is set in a "new Middle Ages fantastic world ,which totally different from world of warcraft." The game apparently takes place in a world wracked by a great war; as the opposing factions have just about battled themselves to exhaustion, a new enemy - the Demon Legion - attacks from another world, scattering both sides of the conflict. Now you, as a young lord, must lead your people to... Well, to be honest it gets a little hard to follow at that point. Of greater interest, however, is the fact that the terms and conditions of World of LordCraft indicate that the game's online service is run by THS International LLC. According to a quick Google search, THS International is, or at least was, a World of Warcraft gold seller that picked up a bit of a reputation in mid-2007 for ripping off its customers. Intrigued? Appalled? Curious either way? There are a few good laughs to be found at worldoflordcraft.com if you're into that sort of thing. Just be careful about handing these guys your credit card number.